In 2005 I was invited to portray the historic Gandhi in India. Newspaper headlines called me "the American Gandhi." My hosts and the media representatives charged me with bringing Gandhi's message to the world. On return at the encouragement of friends I chose to apply Gandhi's principles to the world's issues and needs. Peacemaking takes on a decidedly cultural flavor in India, especially at religiously sponsored events. I just returned from the 7Th International Conference on Peace and Nonviolent Action in Jaipur, India. The primary sponsor is ANUBHIA, a Jain initiated organization for the betterment of the world. (I attended the 6Th ICPNA last December.) It is very clear that this is a religious event with the ritualistic presence of His Holiness Acharya Mahapragya and his retinue. Then, you find that the former President of India, Avul Pakir Jainulabdeen Abdul Kalam, has coauthored a book with His Holiness. The book, The Family and The Nation, gives a succinct overview of cultural and societal history to lead to a vision for a peaceful and just society. Religion is fundamental to the contents, but with a much different rationale than you would find in the United States where separation of church and state has prevailed, at least until recently. To understand this, a person would need to spend some time learning about Hindu religion with its acceptance of diversity, even within the Hindu faith. No centralized body is charged with overseeing orthodoxy and dogma. The ancient culture sets the tone. the individual expresses belief within the culture. As a result, when you look beyond the white clothing of the monks and ignore the blue masks preventing harm to microbes, you find a rationale and scientific presentation for peace and nonviolence. Ahimsa, nonviolence, is the central tenet of Jain religion. (Jain religion is not Hinduism, but comes from the same roots and communicates the same acceptance.) The 7Th ICPNA took another step toward overcoming violence and finding peace in our troubled world. Related to my message is the November 7-9 gathering of the World Economic Forum in Dubai. The attendees were aghast at the state of the world. A "reboot" is needed. It is worth checking. (London, UK). The Foot Prints For Peace Peace Walk from Dublin to London will conclude on August 6th in London. The Walk arrives in London on August 4th for an appearance at Battersea Park from 12:30 until 1:30 PM. August 6th events include a Campaign for Nuclear Disarmament. Commemoration of the atom bombing of Hiroshima, Japan takes place in Tavistock Square from 12:00 noon to 1:00 PM. From there the Peace Walk will proceed to Parliament Square activities at 4:00 PM. The Peace Walkers plan to deliver a powerful message to Number 19 Downing Street. 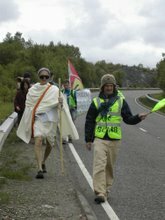 Dressed in loincloth and shawl, the 69 year old activist has walked over 700 miles with Foot Prints For Peace, visiting nuclear power and nuclear armaments bases along the way. Stops were also made at Faslane, Coulport, Sellafield, Dundrennum Firing Range, BAE Systems, Menwith Hill, Fylingdales Ballistic Missile Early Warning Center, and Aldermaston. 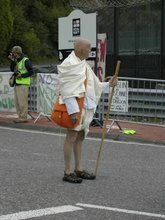 At Aldermaston, Gandhi was arrested again while attempting to give a message about nuclear weapons and nuclear power. 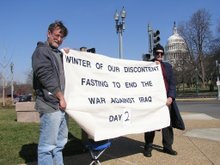 When the journey commenced, Meyer made a statement about his intentions for the long walk: he is attempting to create an awareness of the connection between: global climate change, the effects of peak oil, nuclear war-making and the plight of the poor. "Humanity is at a crossroads," said the American Gandhi. Having made the trek, Meyer comments that his views have not changed. He says, "If anything, they have intensified." The American Gandhi believes there is much to do, and that humans are able to correct their mistakes as well as bring justice and peace to the world. "We are Salt of the earth, water, air"
I am fortunately a healthy 70 year old who has been through many of life's twists and turns. I thrust myself into activism in 1965 as a young Catholic priest after being raised in a Cleveland Ohio working class family. Soon, I was embroiled in resisting the war in Vietnam, fighting racism, and working to end poverty. 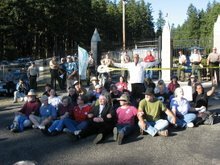 I ended up being arrested by both Church and government in separate direct actions in the nonviolent spirit of Jesus, Gandhi, and Martin Luther King Jr. After raising a family of three children, I now spend my time on the issues mentioned, working with other activists and portraying Gandhi. I have been doing this for the last five years. 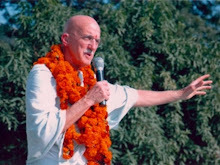 While portraying Gandhi in India in 2005, I was named "the American Gandhi." I have come to do things like the subject of this blog. I see peacemaking as beginning with me, with the individual, and extending into all human relationships and organizations, all the to international relations. My book will illustrate my experiences and insights about peace making.